Canwell Priory was dissolved in 1530, and the property was acquired by Bishop Vesey. Vesey bequeathed Canwell to the descendants of his brother, Hugh Harman, and by 1820 Canwell Hall and its estate were in the possession of Sir Robert Lawley. Parts of the estate lay within the Sutton boundary, including 19½ acres at Roughley - here stood a row of four cottages, one of which was a stone house built by Bishop Vesey (now Vesey Grange). The properties in Sutton belonging to Canwell were inconvenient, being small and disconnected, but the opportunity soon arose for Sir Robert Lawley to consolidate and increase his Sutton holdings. The extensive commons in Sutton were to be enclosed by an Act of Parliament of 1824, so Sir Robert was able to purchase some of the former common land which was sold to defray the Enclosure Commissioner’s expenses. The Act also empowered the Commissioner to approve exchanges of property between those affected by the enclosure - Sir Robert used this facility to give up some of his scattered holdings in return for other land which gave him a more viable estate. One such exchange gave Sir Robert (now Lord Wenlock) some Corporation land near Slade Lane in return for 19½ acres “situate at Roughley being four tenements outbuildings and gardens…with five old enclosures” bounded by Little Sutton Road, Slade Road and Weeford Road. The cottages now belonged to the Warden and Society of Sutton, which was superseded in 1886 by the Borough of Sutton Coldfield with a new Charter - this charter provided for the charitable estates of the former town to be vested in a separate body known as the Sutton Coldfield Municipal Charities. In 1903 the Charity’s surveyor, William Fowler, reported on the state of all its property, recommending repairs where required, except for “the property occupied by Littlehales and others at Little Sutton; it is a very old house which has been divided into three cottages, one part of the building has fallen down and in my opinion another portion is dangerous”. Some of the trustees inspected the cottages in November, and in January they appointed an architect to advise them. 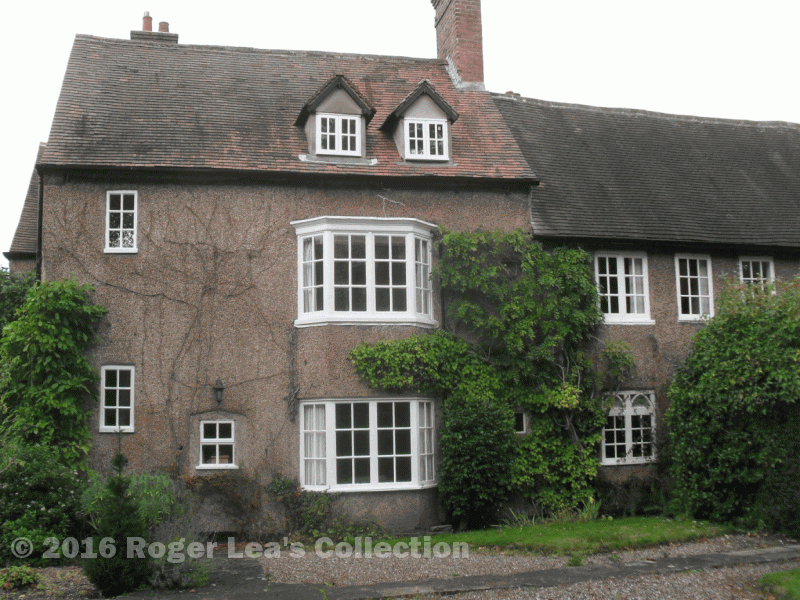 Vesey Grange, by E.F.Titley in the arts and crafts style - rough-cast walls, small-paned casement windows, two-storey bays and steep roofs. The original stone building was retained, but with an added bay window, a blocked-in doorway and enlarged windows to light the spiral stone staircase. The rebuilt cottage to the right has a handsome doorframe; altogether the house has six bedrooms and three reception rooms.